Christian Swenson is a shaman of delight. A solitary performer dreaming out loud in the wilderness of the bodyvoice; he interweaves the mysterious and the obvious with immediacy, power and vulnerability. In 1979 Christian began accompanying his dancing with his voice and has toured the world sharing his joy in “our original instrument”. He has developed a wholly original mode of performing he calls, “Human Jazz” where his body shapes his voice and his voice shapes his body. 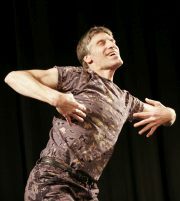 Improvising and singing in and out of songs, he transports himself and the audience to a place of alertness and wonder. The show will conclude with Christian leading audience volunteers in a simple but wildly energetic version of Balinese Monkey Chant.